I’m planning on make quite a few Halloween posts this month and even have a few ideas for some videos! Watch this space! 1 // £7 ON SALE @ River Island! I just think it’s a super cute tee and i’d wear it at any time of the year! 2 // £44 ON SALE @ Nasty Gal! This velvet kitty dress is just perfect for this time of year! Again, I’d wear this all year round because, well, kitty! 3 // £22.99 @ New Look! I’m a sucker for big cosy looking jumpers anyway, but the added bonus is of course the “Boo” slogan! Perfect? I think so! 4 // £7.99 @ New Look! 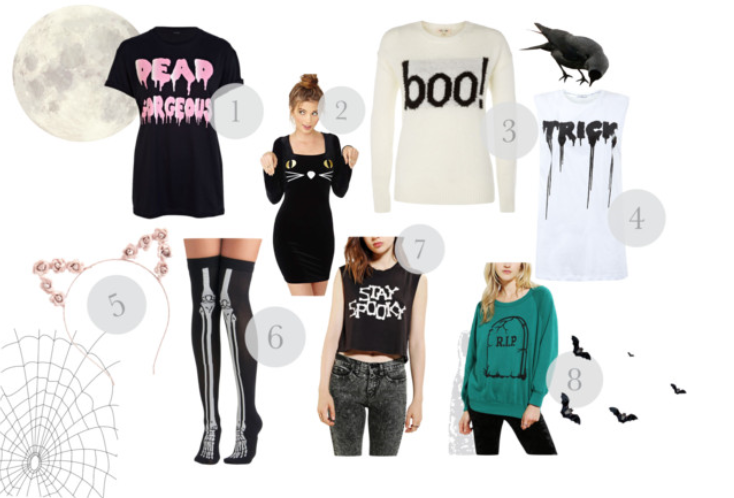 New Look have quite a few of awesome Halloween themed items! Trick or treat, smell my feet, give me something good to eat! 5 // £3 ON SALE @ Charlotte Russe! Cute kitty ears? Why not! 6 // £12 @ Modcloth! What a surprise, we’re back at modcloth! I seriously can’t get enough. Knee high socks are awesome, but these are on another level! 7 // £19 @ Urban Outfitters! They’ve also got a nice selection of Halloween goodies! Keep it creepy and stay spooky! 8 // £22 @ Urban Outfitters! Last but not least is this baggy sweatshirt that I’m in love with, not just the design but the colour as well! Are you loving any of these items? What have you got planned for Halloween?